It looks like 2013 will have us powdering our faces more than ever. There's a new generation of finishing powders coming out and joining old favorites such as Guerlain Meteorites Perles (we recently heard about one such release from NARS). The new range of six such pressed powders by Hourglass, Ambient Lighting Powder, sounds especially intriguing. They come in several shades and various degrees of luminosity/pearliness. From the description in the press release it looks like these are a highlighter and finishing powder hybrid, with the exception of the last on the list, LUMINOUS LIGHT; the description below makes me believe this one is straight-on highlighter. The powders can be combined for the desired effect, and there's a brush that's sold separately ($35, I'm not sure this one is a must have for most of us, but it looks nice). "DIFFUSED LIGHT: A soft, warm, pale yellow powder. Light your skin with DIFFUSED LIGHT to reduce redness and give skin clarity – like a soft ray of morning light. LUMINOUS LIGHT: A champagne pearl powder. Light your skin with LUMINOUS LIGHT to create a soft, incandescent candlelit glow – day or night." 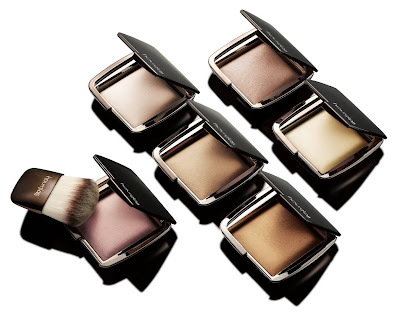 Hourglass Ambient Lighting Powder ($45 each) will be available in February 2013 from Barneys New York, Bergdorf Goodman, Sephora, Sephora.com and Space NK. Photo and information: Hourglass Cosmetics. I'd heard about these and am dying to try them. Hourglass are generally super-reliable when it comes to quality and if the effects are noticeably different, I can seriously see myself getting several. I'm really intrigued by these... L Mercier starlight/ candlelight powder creates a similar sounding effect but is a bit sparkly for me so I just use it as a highlight now. These sound really great - I hope they're as good as they sound! And not too sparkly. Looking for an undereye highlighter..since I won't be able to see these in person, any advice as to which one might work is helpful.Thanks.